Hi all, I thought I would put together a complete “guide” if you will for a Pre-89 1UZ-FE swapped Supra. This swap is gaining in popularity so I figured if we have a good platform to get wiring information it would help ease the process. 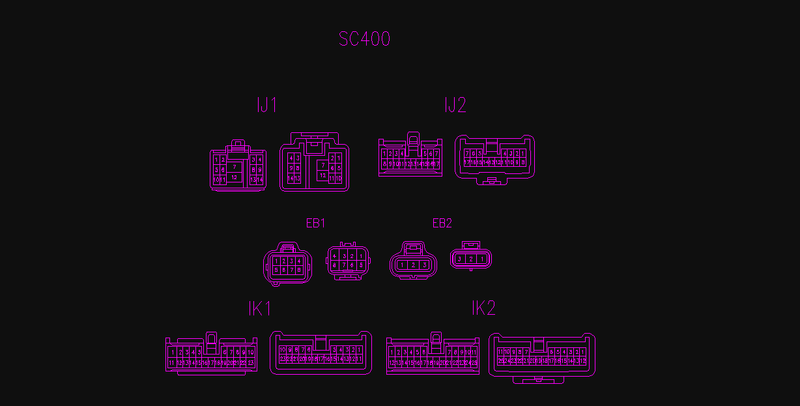 First I will list the Supra connectors, then a short description, and pin layout. Then I will list the 1UZ-FE connectors, then a short description, and pin layout. Finally I will give a “guide” to connecting the two to make a running vehicle. This "guide" will be dynamic until otherwise said, so I will be updating this periodically as I gain information. I used a EWD Book for a 1986.5 Supra (NA Only), and a EWD book for a 1994 SC (300 & 400), and 1997 SC (300 & 400). 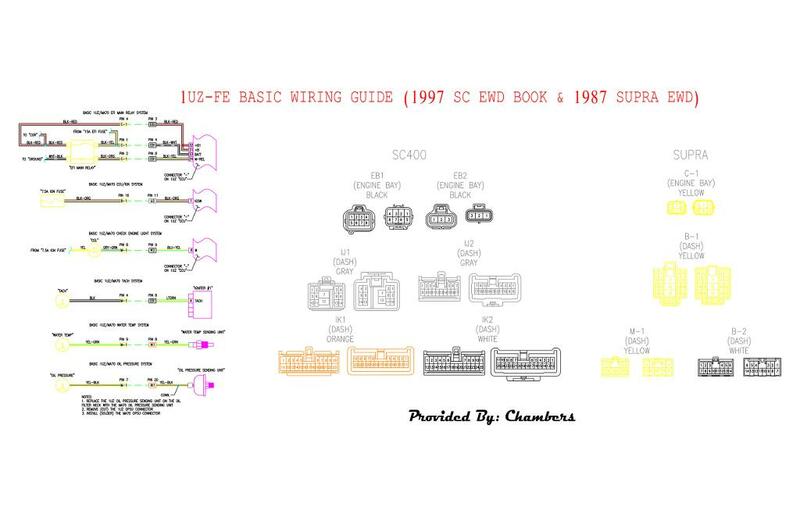 1994-1997 SC3/400 from my understanding were transition years in wiring much like our Pre-89 to 89 to Post-89 Supra wiring. So I have started with a 1994 EWD, I just recently picked up a 1997 EWD, and I plan to get a 1996 soon. In my 87 I have a post 1996 (A transition year for the 1UZ) and I noticed a few extra wires on plug IJ1 that needed power but the 1994 book worked just fine. Since there is so much information I will attempt to post in separate replies, Thanks for looking. 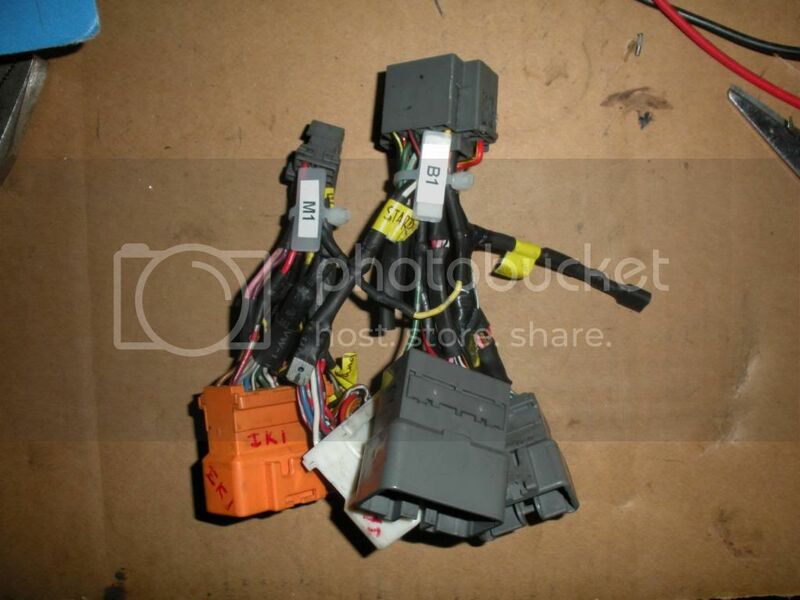 § From “A/C Magnetic Clutch Relay" to "ECU"
§ From “Neutral Safety S/W" to "Starter Relay"
§ From “30A EFU Fuse" to "ECU"
§ From “7.5A TRAC Fuse" to "Traction ECU"
§ From “Short Pin" to "ABS Actuator Relay"
§ From “A/C Ambient Temp. Sensor" to "Ground"
§ From “ECU" to "EFI Main Relay"
§ From “Ignition Main Relay" to "Ignition System" and "Fuel Injectors"
§ From "EFI Main Relay" to "ECU (+B & +B1" and "Misc. Equipment (+B)"
§ From "IGN S/W" to "Injectors" and "IGN Coil 2"
§ From "Vapor Pressure Sensor" to "ECU"
§ From “7.5A ST Fuse” to “Neutral Safety S/W” and "ECU"
§ From "IGN S/W" to "IGN Coil 1" and "Igniters" and "Injectors"
§ From “Comb. Meter” to "ECU"
§ From "Cooling Fan ECU" to "Solenoid Valve (Cooling Fan)"
§ From “Stop Light S/W” to “ECU” and "TRAC ECU"
§ From "7.5A TAIL Fuse" to "ECU"
§ From "Cooling Fan ECU" to "Data Link Connector 1"
§ From "Solenoid Valve (Cooling Fan)" to "Cooling Fan ECU"
§ From "Data Link Connector 3" to "Ground"
§ From "ECU" to "Data Link Connector 3"
§ From "Shielded Black Pin 18 IK1" to "Ground"
§ From "ABS SPD Sensor Rear Left" to "TRAC ECU"
§ From "ABS SPD Sensor Rear Right" to "TRAC ECU"
§ From "Right o2 Sub" to "ECU"
§ From "Brake Fluid Level S/W" to "TRAC ECU"
§ From “EFI Main Relay" to "AFM (+B & +B1" and "Misc. Equipment (+B)"
Good stuff... I was able to gleem some 86.5 wiring knowledge from your info and can now move along with one of my projects. Definitely a great pin out! I really wish I had this when I was doing my swap ha ha! I was trying to get this info out sooner but I needed to learn more about the 1UZ wiring changes before posting. I have some additional material ( sc400 tewd) that might be usefull. Please send any extra info, what year EWD do you have? 1997 List Updated, IJ1 and IJ2. just found the 94 book again. what info would you like me to take pictures of? The engine control wiring, mainly need to see if your book has the wiring for the cold start injector, mine does not. Thanks, you have a PM regarding the same subject. Major Update, I have assembled the Guide for the 1997 1UZ-FE - Pre-89 MA70 Supra. Scroll down below the pinout info on the first page to see. hey, did you ever get the 94 tewd photos I sent you months ago? Yup, they matched the book I had. I'm thinking Im going to order the 1992 and 1996 books next. 1992-1994 SCx00 are the same and 1995-1997 SCx00 are the same. In 1998 they started running the VVTi versions of both the 2JZ-GE and 1UZ-FE. For the purpose of putting a 1UZ into an MA70 chassis, the small changes in 1UZ harnesses is irrelevant. ...For the purpose of putting a 1UZ into an MA70 chassis, the small changes in 1UZ harnesses is irrelevant. Not true, for MA70 swaps on the SC connector IJ1 pre 96 has less power wires for the electrical engine components. I had wired my jumper harness for pre 96 and my harness is from a 96, well it didn't run. Thats because some of the engine harness was not getting power. If you pull connectors from pre 96 SC vs 96-98 they differ slightly. IJ1 had the biggest change it seems, and from what I have learned the pre 96 fuel injectors are wired differently than the 96-98. I don't suppose you could be more specific? I'm doing a '96 1UZ into an '89 MA70, and I can't get my ECU to turn on. Post 96 1UZs have an extra wire on the 1J1 plug for the fuel injectors; I just jumpered it into a switched source (B-1, Pin 17[black-orange], if I remember correctly) and that solved the injector problem. I also found an extra black-white wire (IJ1, Pin 3) that needed a switched source for the ignition coils. As far as I can tell, those were the only extra changes that had to be done for my '96 1UZ. However, I've done the changes and wired in the CEL and I see that the CEL does not turn on when the key is in the on position, and I'm getting no spark although the Coils and Igniters are showing 12 volts. Do you remember any other changes you had to make? Perhaps some extra grounds? No extra grounds that I'm aware of. 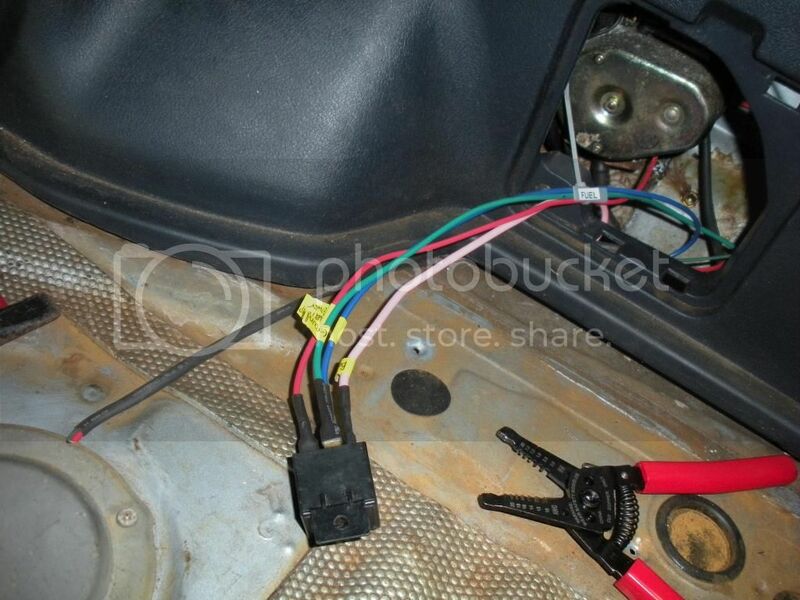 In the dash, is your Black-Orange wire from pin 16 on B-1 connected to the Black-Orange wire from pin 11 on IJ2? That wire comes from your ignition switch, when its tuned to the on position it tells the ECU to kick the EFI-Main relay on, without it the engine will not run. Pre-96 1UZ igniter and fuel injectors get their power from EB2 in the engine bay. 96 and up igniter and fuel injectors get there power from IJ1 at pin 3 and pin 7 both Black-White color, in the dash. Yup. I made a patch harness between the two, using 7M Harness connectors and SC400 body connectors. - The fuel pump, which I've wired into a separate 30A relay; utilizing the 12 volt mod. I've also made patch harnesses to merge EB1 and EB2 into the MA70 body harness/Fuse box. I'm at a loss, man. I've looked over my wiring a million times and I can't find a reason why the ECU isn't kicking on. I could understand if the EFI Relay went bad, since the car sat for three years, but wouldn't the ECU still turn on (CEL at on position) with a bad EFI Relay? 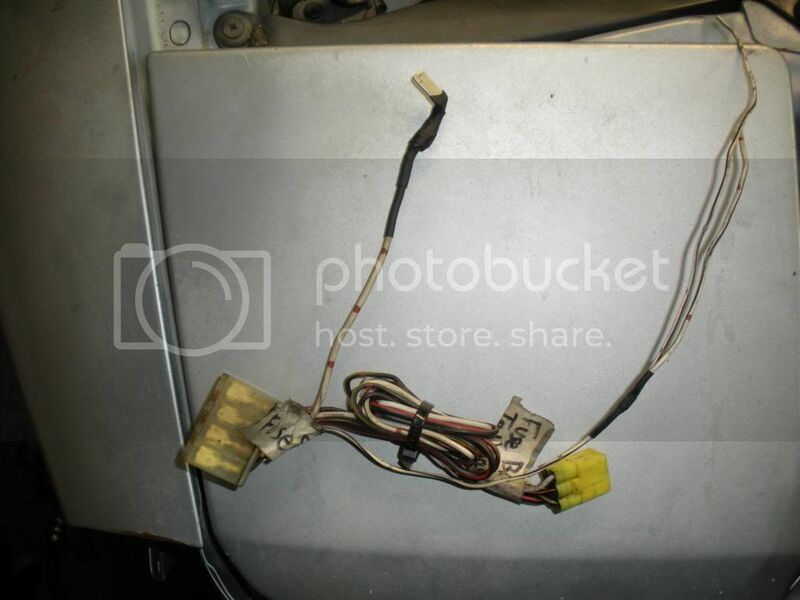 Looks like you did a nice job on your swap harness. If the EFI main relay does not kick on then the ECU will not see any power. Pull the relay and test it. I had an 89 that wouldn't kick the EFI main relay turns out the ignition switch went bad, one of the terminals corroded and fell apart. That caused the 7.5a IGN fuse to blow, witch ultimately kept the ECU from getting power. Something to consider. Right now I suggest looking over your engine bay wiring. Thanks a lot, man; for the compliment and for the advice. 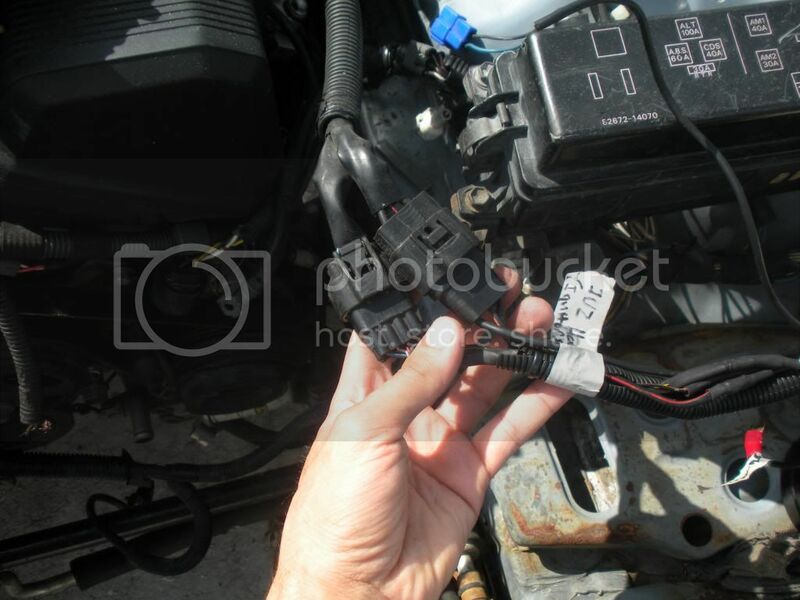 I will test the EFI Relay and take a closer look at my engine bay wiring as soon as possible. Thank you, 4U2QUIK; and thanks again, Chambers. I started up my car for the first time today; as it turns out I made a mistake with the engine bay wiring. It's all fixed now. same color as my first uz supra. in your earlier post you were asking if the diagram had wiring for a cold start injector . I thought that was only on the pre 92 models, aka the LS400 ? Im buying a 1990 ewd for a 1990 ls400 . Only because that happens to be the Ecu and wire harness i currently have. im still using a sc motor/ oil pan and all, just dont have the wiring ecu for it . i'VE SEEN THE COLD START ALL THE WAY UP TO 94. Thank you, 4U2QUIK; and thanks again, Chambers. I started up my car for the first time today; as it turns out, I made a mistake with the engine bay wiring. It's all fixed now. It's a huge difference and you're basically setting yourself up to do tons more wiring to get it to work with the supra chasis. also you would still need the sc400 oil pan and pickup which are harder to find than an entire engine. Is there a drawing of how to wire the fuse box connectors or is that on the first page? My 1UZ came with a cut harness and no ECU so I have to do a lot of detective work to figure out what year my motor is and which plugs and ecu I need... anyone have any tell-ale info for me to verify what year mine is? On the SC harness the plugs are the same 92-97, after that it gets a little fuzzy. I havent dealt with anything newer than the 97 EWD book and an actual 96 harness. You will need dash plugs (5 total; 4 needed) IJ1, IJ2, IK1, IK2, and II1 if you want to control your heater valve. In the SC they are a PITA to get to/out but its possible withoud removing the dash. In the engine bay you only really need EB1 and EB2, In the SC its located on the front of the fuse box. The diagram at the bottom of the first post shows the EFI wiring layout in the engine bay (fuse box), the starter goes through EB1 but its not on that schematic. the ls400 harness is a lot different from what I recall. Just updated a few missing images, should be good now! Is there any way to fix this dead image? Or pm it to me?